A light, creamy dessert perfect for alfresco entertaining. Get ahead - make this easy cheesecake the day before and decorate with the fresh strawberries one hour before serving. Crush the digestive and amaretti biscuits, either in a blender or by putting them in a food bag and lightly beating them with a rolling pin. Melt the butter. Remove from the heat and combine with the crushed biscuits. Press into a 20 cm loose-bottomed baking tin and chill. Meanwhile, rinse and zest the lemons. Cut them in half and squeeze for the juice. Combine the cornflour, sugar and zest and juice of the lemons in a small pan. Cook over a low heat, stirring continuously, until thickened. Whip the double cream to soft peaks. Beat the ricotta into the lemon paste. Stir in the whipped cream. Spread the creamy mixture over the biscuit mixture and return the tin to the fridge. Wash and hull the strawberries and slice them thinly, lengthways. 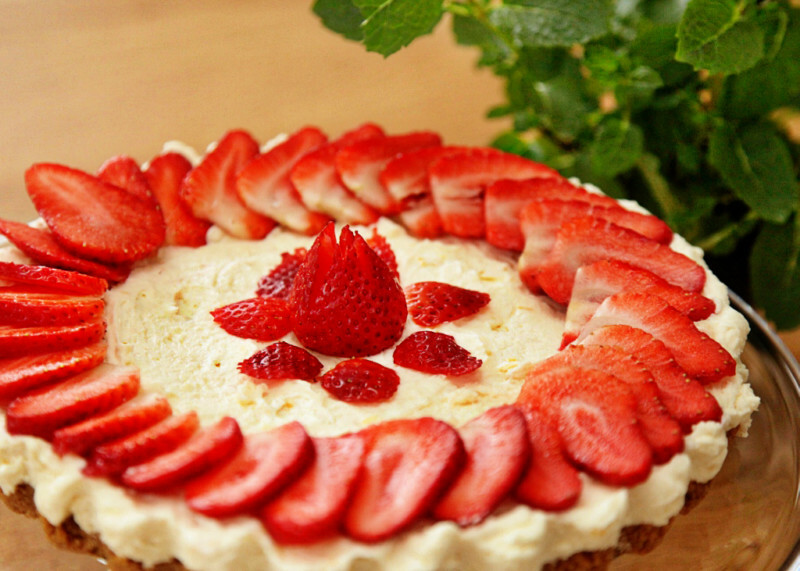 Decorate the cheesecake with the strawberries and chill until ready to serve.